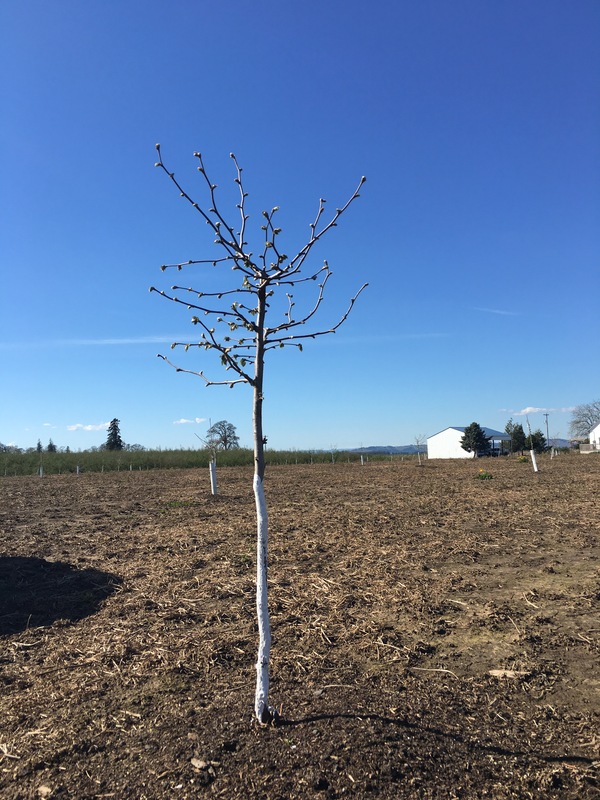 There are a number of new plantings of filbert (hazelnut) orchards around. Our latest planting was 3 years ago. And it was time to remove the tree guards, which makes them all look very, well, naked! This is a tree with a protector. 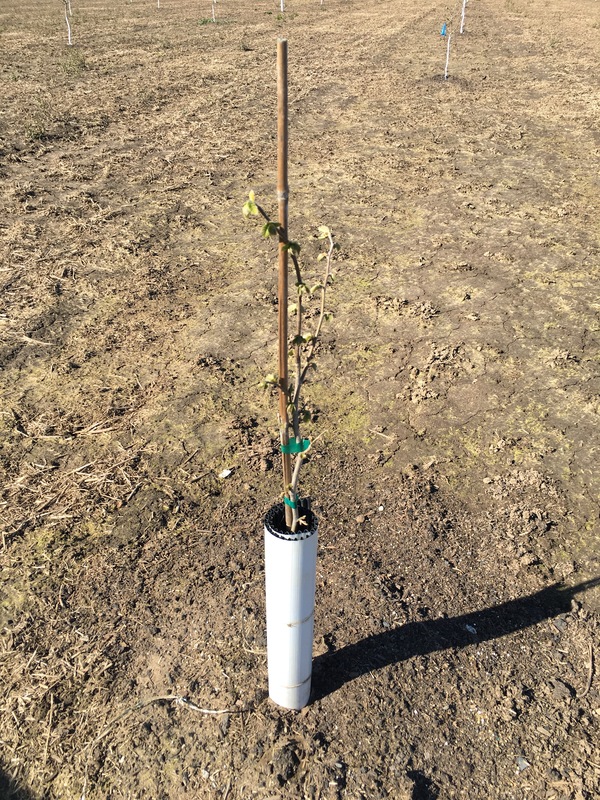 The white tube protects from the hot sun, the cold freeze, herbicide applications, mice and other pests. 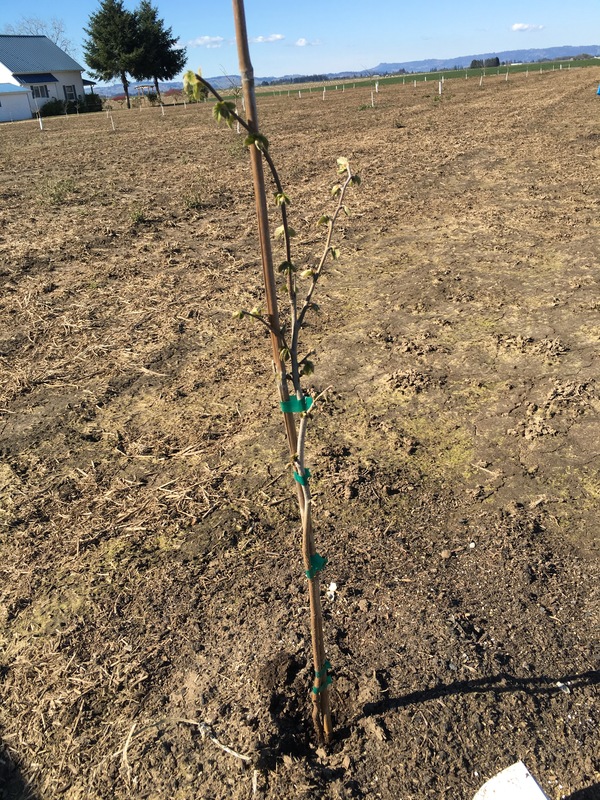 It’s an important part of a trees life when it gets planted out in “real world” fields. So once they get old enough, usually around year three, it’s time to start the process of hardening the tree bark. To do this however the trees aren’t naked for long. We slowly get them ready for life without a protector by painting the trunk of the tree. Which looks like the photo below. This paint will not protect against as much as the physical barrier provided by the original protector. But it will act as sunscreen and allow for the bark to harden. Many times you see painted trees and it’s a very common practice to paint the bark for protection from the sun, just like we put on sunscreen, same for many trees. Which brings me to the reminder to wear your sunscreen today…it’s a sunny day here in Oregon! Happy Friday folks!! Oh, wow, this is gorgeous! Brilliant that you provided it with some shelter. It’s not too often that people actually know to do this or remember and the outcome is usually disappointing. Best of luck with the little fella!